Blair addresses delegates during the Sierra Leone Trade and Investment Forum in central London on November 18, 2009. London, England (CNN) -- It is not uncommon to see people snoozing in the public gallery of Britain's Iraq Inquiry. The sessions are long. There is lots of detail. Everyone speaks softly and are unfailingly polite. But this calm, dry, often dull investigation is about to be transformed into a stage for the hottest political theater in town. 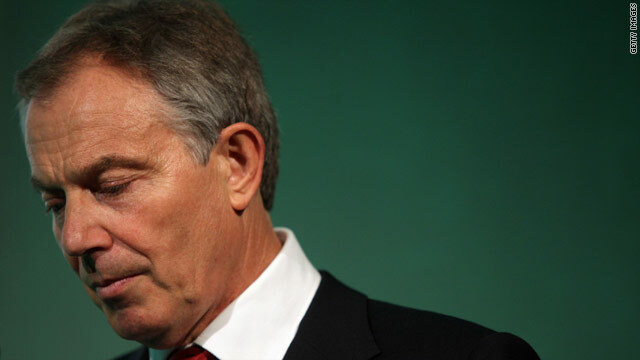 Former Prime Minister Tony Blair's appearance Friday is the inquiry's highly anticipated climax. The event has triggered a massive security operation. It will be an international media circus and a rallying point for protesters still outraged by Britain's involvement in the conflict. It will also be a deeply significant moment for the families of 179 British military personnel who did not return from Iraq. Reg Keys lost his 20-year-old son, Tom, in the war. He later ran against Tony Blair in his own constituency in the 2005 general election. He will be among the relatives of fallen soldiers in the hearing room as Blair gives evidence. "I just think back to all those years ago when Tom said to me, 'Dad, we have to go to war. There's a madman out there in Iraq about to unleash his weapons upon us.' And I looked at Tony Blair and I gave that man my support," Keys said. "He's betrayed me. He's betrayed the British public. But worst of all, he's betrayed those soldiers who have laid down their lives. Those soldiers died for a lie." Keys noted he was looking for "some sort of accountability and some sort of closure on the grieving process." When did Tony Blair commit to war? Britain's former ambassador to the United States, Christopher Meyer, told the inquiry it was possible a deal was "signed in blood" between Blair and U.S. President George W. Bush at a meeting in Texas almost a year before the invasion. Some of Blair's closest advisors from the time have denied it, but The Iraq Inquiry has continued to show a keen interest in that meeting and what the leaders talked about. Some questions are also expected about personal letters Blair sent Bush about Iraq in the lead up to war and to what extent they promised Britain's involvement. Why did Tony Blair commit to war? Before the invasion, Blair insisted the aim was dealing with Saddam Hussein's alleged weapons of mass destruction. But former Foreign Secretary Jack Straw suggested Blair believed regime change in Iraq was also a goal worthy of military action. In a BBC interview in December, Blair himself said he would have considered war even if he had known there was no WMD threat. Why was intelligence interpreted so badly? The panel has made it clear it believes the available intelligence on Iraq's WMD program was uncertain. But some of Blair's language back then was absolute. The inquiry has repeatedly drilled in on two key phrases. In the preface to a dossier of intelligence published in September 2002, Blair said: "I am in no doubt that the threat is serious, and current; that he has made progress on WMD." He later told parliament: "His WMD program is active, detailed and growing." It is likely Blair will be asked to justify those statements. Also expect questions on the old allegation that the government "sexed up" its intelligence, especially when it claimed Iraq could deploy WMD within 45 minutes. Did British forces have sufficient time to prepare for war? Former Defence Secretary Geoff Hoon told the inquiry Blair didn't allow military preparations to begin until the last moment for fear of sending the wrong message while Britain was trying to get an agreement at the United Nations. All witnesses are asked this question. One of Blair's closest advisors, former communications director Alastair Campbell, answered by saying Britain should be proud of the war and he felt privileged to be part of it. It will be interesting to hear Tony Blair's response with Reg Keys and other relatives of fallen soldiers sitting just a few feet behind him.